Proper nutrition and healthy eating are important aspects of living a healthy lifestyle and keeping your energy levels up during the day. However, many Canadians fall short and tend to choose a quick fix or sugary treat over a nutrient-rich meal. Many of our poor eating habits are associated with the typical workday. Most of us spend one-third of our weekdays at work, and this doesn’t even account for the time we spend getting ready and commuting to and from work. Therefore, it’s important to also spend time focusing on the food we eat before, during and after the workday. Mastering healthy eating during your workdays will go a long way in helping improve your eating habits and overall health. Breakfast is the most frequently skipped meal of the day, but it is the most important meal. It sets the tone for how you will eat and perform for the remainder of the day. People who skip breakfast tend to eat more during the rest of the day, and they tend to have lower energy levels. Don’t skip breakfast: Just don’t do it. Ever. Keep it simple: Yogurt, fruit, protein shakes and nuts are quick and easy foods to prepare and consume in the morning. 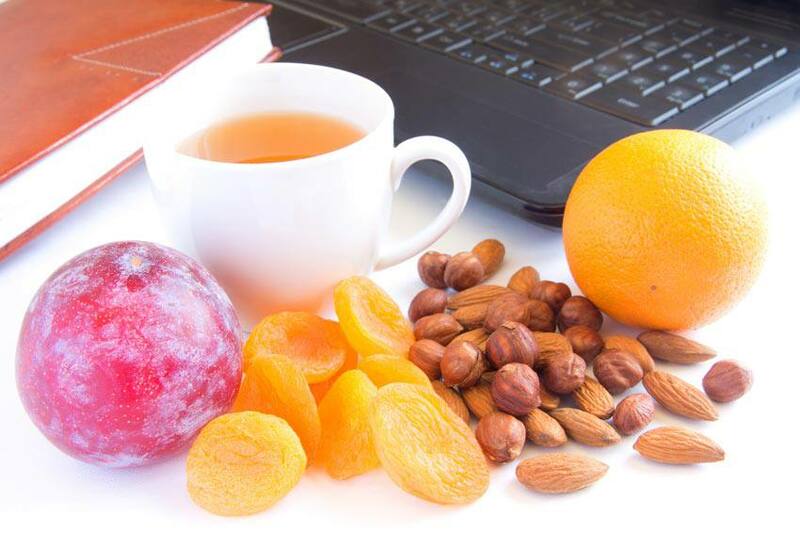 Have a backup plan: If are in a rush and skip breakfast at home, keep a few items at work, such as nuts, dried fruit, granola bars or protein bars, just in case. This will reduce the temptation to grab a donut on your way in. The availability of junk food is a huge temptation for some people. Vending machines, food in the break room, networking events, meeting snacks and catered lunches are all a threat to your waistline. Lunchtime is always a temptation. From delicious foods in your office cafeteria to going out to eat with your colleagues, it can be hard to stick to your guns. Bring your lunch: This is the most reliable way to control what is in your meal. Allow yourself to eat out from time to time: It’s okay to treat yourself now and then, and it may actually help you stick to your healthy eating plan and give you something to look forward to during the week. Plan a mid-afternoon snack: This will keep you content until you get home from work. Many of us have jobs that keep us on the go. If you have to eat out, make the best choice possible given what is available to you. Following these tips throughout your workweek will help you keep on track and make better food choices, even if you slip once in awhile or have a slice of cake for a colleague’s birthday. As long as you make good food choices most of the time, you’ll be just fine.